bypass - does not work on AVH-4x00NEX devices. only for AVIC of all versions NEX. 8200Nex. I did the parking brake green to ground wire and pressed the lower left corner. Confirmed it worked for me. So is there a way to bypass the 4400NEX? I applied the software bypass to my 8200 NEX unit and grounded the parking brake and it appears to have worked, but there is some weird behavior. Before I get started. I'm a computer hardware/software engineer and I work in the enterprise storage/server space on linux kernel modules and embedded systems so my background in this field is strong. I intermittently get the "Parking brake misconfigured" message and I suspect I know the reason. It seems like I get this message whenever the car starts moving before the head unit has fully booted. My explanation of this has to do with the NEX boot loader on the radio and non-volatile configuration settings. I believe that the software bypass feature is read from non-volatile storage somewhere during the boot procedure of the radio. This means that by default the radio starts to boot with the bypass disabled, and at some point during the boot procedure the unit reads the software setting out of their non-volatile storage. This would explain the behavior I have seen with the "Parking brake misconfigured" message appearing whenever I start driving the car before the radio is finished booting. I'll keep paying attention to the behavior and if something changes I'll update my hypothesis. I just posted in another thread about this & wondered if the 8200 has the same configuration as my 8100. 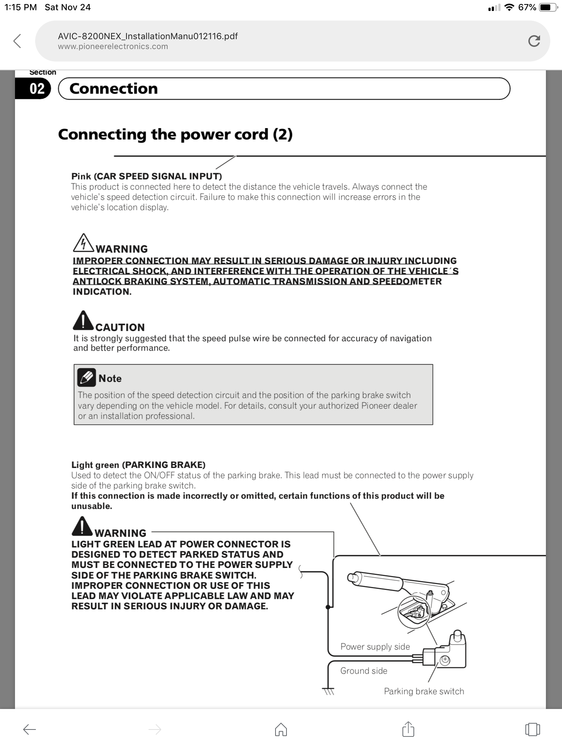 The installation instructions direct to connect the green wire to the powered side of the parking brake switch, which is opposite from all the advice I received when having issues similar to yours. I abandoned the green wire and did the bypass as instructed in this section of this site. Edit; I had similar issues when moving before boot and nag screen "OK" when my green wire was grounded. I have a AHV-W4400 and installed the MicroBypass. But the 4400 has a GPS now and it picks up the cars speed. Any one know if there is a way to by fully pass the AVH-W4400NEX? Getting ready to install a w6400nex....and will use it with Android Auto. Read this whole thread.....but still can't decide: can I skip using the VSS, parking brake, and reverse wires, and the unit will function 100% (with no stupid warning messages). I did read about the soft bypass, but still can't tell if the brake wire needs to be grounded. I thought the answer was "no" for the newer NEX models. But also curious about the VSS and reverse: VSS should be easily skipped (only helps increase GPS accuracy), but does Android Auto require reverse wire like Carplay? Edit: 4/14/19. I consulted with a car forum I'm on, and folks in that group confirmed that I don't need any of the wires (VSS, parking, reverse) for everything to work ok. Since I'm not installing a backup camera, I don't care about the reverse either.